Ben Franklin's Important Discovery of the Lightning Rod! 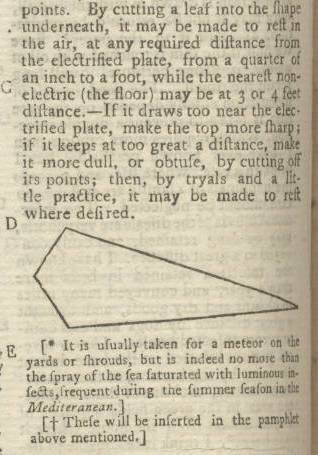 This issue of Gentleman's Magazine contains an historic letter from Ben Franklin on his discovery of the lightning rod to Peter Collinson, a Fellow of the Royal Society( thus the introduction says the article is an "extract of a Letter to P.C. F. R. S.") In the book, “The Lightning Discharge” by Martin Ulman, the author states that “In 1749 Benjamin Franklin wrote a letter that was published in Gentleman’s Magazine, May 1750, whose editor Edward Cave later published Franklin’s book on electricity” The book then quotes extensively from the letter in this issue and states, “This is Franklin’s earliest recorded suggestion of the lightning rod.” Franklin’s first electricity book, really an 86 page pamphlet, referred to in the last sentence was entitled “EXPERIMENTS AND OBSERVATIONS ON ELECTRICITY, MADE AT PHILADELPHIA IN AMERICA, BY MR. BENJAMIN FRANKLIN, AND COMMUNICATED IN SEVERAL LETTERS TO MR. P. COLLINSON, ESQ; OF LONDON, F.R.S.” and it was published the following year by Cave and it includes the letter excerpted above. To get a copy of the 1751 edition of that book/pamphlet will cost over $60,000. The original letter from Franklin to Collinson, if available, would cost hundreds of thousand dollars. The lightning rod was the first practical use for the discovery of electricity and it, along with his famous kite experiment published in December 1752, made Ben Franklin an international celebrity. Collinson tried to get the Royal Society to publish the book that Cave later published but they refused to do so, a mistake they later remedied by honoring him with a medal and then membership in the Royal Society. 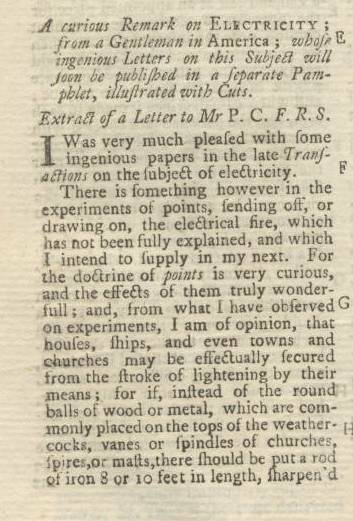 The earliest mention of Franklin's investigations of electricity were noted in the January 1750 issue of Gentleman's Magazine. 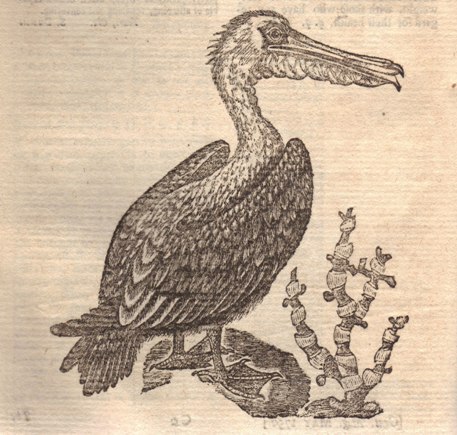 This issue of Gentleman's Magazine also includes an article on the American Pelican with a nice copper engraving of an example of the species. 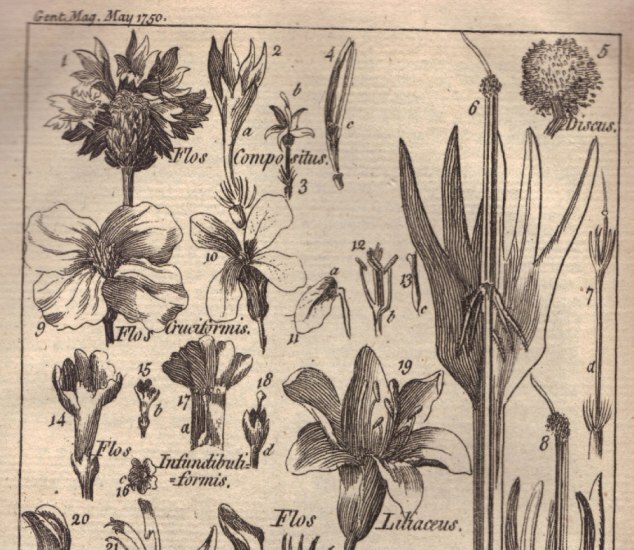 This issue also includes an article on the terms florists use with a matching plate of flowers, part of which is shown below. 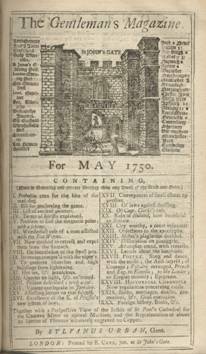 Ben Franklin's sterling achievement which has probably saved billions of dollars of property damage was first reported to world in this 1750 publication. A rare find for science and Franklin collectors.